1. 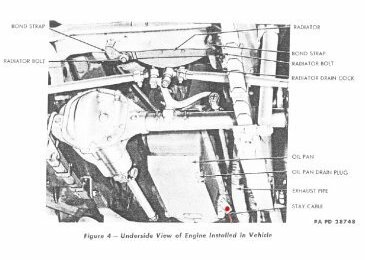 The Engine Stay cable tends to be a missing piece on most unrestored, farm found jeeps. 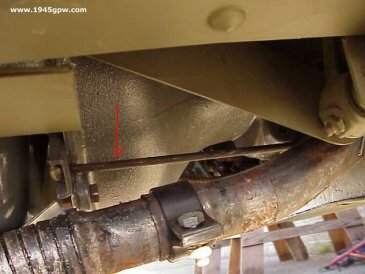 If you are restoring your WWII Jeep to drive around regularly, you should make sure that you include this valuable item. 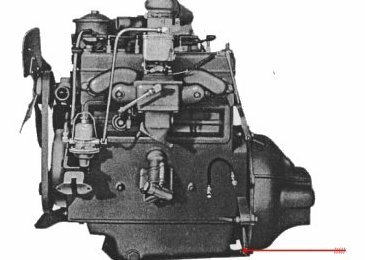 In the photo, you see that the cable connects to the Engine rear plate. 3. 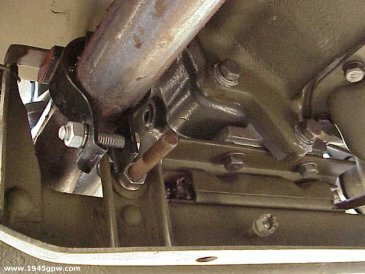 Here you see in the photo that one end of the cable is a knob that will slide through the engine back plate and extend back to the crossmember that the transmission is resting on. 4. Here you see the back of the stay cable which is tightened by a bolt. You want to slide it through the bracket on the crossmember shown with an arrow. 5. 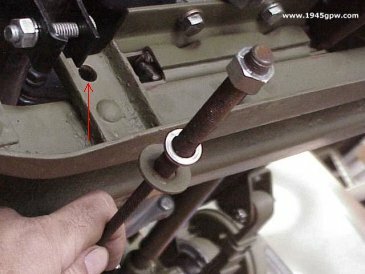 Tighten the bolt so it is snug but not tight. The purpose of this cable is to stop the engine from going forward driving the fan into the radiator or some other damage. Without this cable, a drop in a forward position can drive the engine forward and cause significant damage.